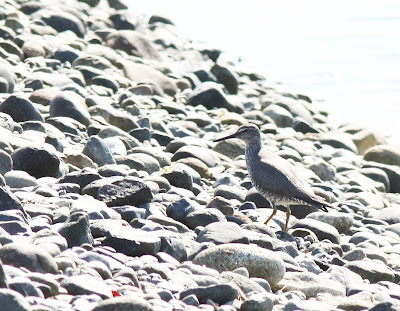 A Wandering Tattlers was seen at the mouth of French Creek this morning July 27. It left after a few minutes heading east towards Parksville. 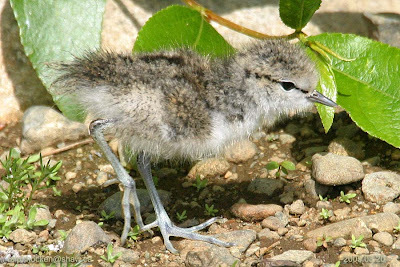 A newborn Spotted Sandpiper: Ralph Hocken Photo. The Sunday Bird Walk went to Neck Point Park in Nanaimo. The morning was sunny and warm. The highlights included seeing a House Wren perching before taking insects into a nesting cavity in a tall snag. This is the first time that the group could remember seeing a House Wren in this area. We heard what sounded like a small flock of White-winged Crossbills flying over the point. The sound was a very mechanical trill--definitely different from the musical sounds of the more common Red Crossbills. We saw three Pigeon Guillemots playing on the water just past the large rocks and two Spotted Sandpipers bobbing just off the tide line at Sunset Beach. Double-crested Cormorant, Pelagic Cormorant, Surf Scoters, Turkey Vulture, Bald Eagle, Spotted Sandpiper, California Quail, California Gull, Glaucous-winged Gull, Pigeon Guillemot, Marbled Murrelet, Rufous Hummingbird, Northern Flicker, Pacific-slope Flycatcher, Northwestern Crow, Chestnut-backed Chickadee, Red-breasted Nuthatch, Brown Creeper, Bewick's Wren, House Wren, Swainson's Thrush, American Robin, European Starling, Brown-headed Cowbird, Spotted Towhee, Song Sparrow, House Finch, Purple Finch, Red Crossbills, White-winged Crossbills and American Goldfinch. A Black Swift was spotted high over Meridian Way in Parksville. A Yellow Warbler was seen in the 3000 block of Hammond Bay Road in Nanaimo. Two Arctic Terns were heard and seen flying above Cox Bay near Tofino. A Bonaparte's Gull was seen on the French Creek Estuary. A pair of fledgling Barred Owls were seen and heard along a strip of parkland between Lintlaw Road and Beaver Creek Terrace in the Diver Lake area of Nanaimo. Monday September 28, 2009 @ 7:30 pm. The Backyard Wildbird & Nature Store's weekly bird walk in the Parksville/Qualicum Beach area on Tuesday mornings will not be held during the summer months. We will resume the Tuesday bird walks on September 01, 2009. The Sunday Bird Walk on July 26 will be going to Hemer Park in Cedar. Meet at the Bird store at 9:00 a.m. or at the parking area off Hemer Road at Hemer Park at about 9:30 a.m. The Sunday Bird Walk went to Legacy Marsh in Upper Lantzville. The morning was sunny and warm. The highlights included seeing Willow Flycatchers, Western Tanagers and Cedar Waxwings all perched close to the trail and singing. 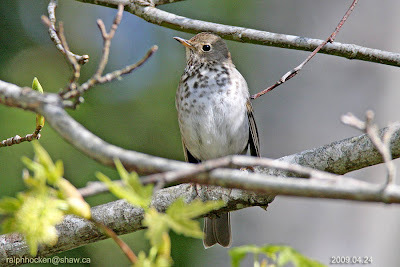 There was a Swainson's Thrush perched on a tree and singing his heart out, not far from the road. Barn Swallow, Northern Rough-winged Swallows and Violet-green Swallows flew overhead hawking insects. An Osprey flew by with a Turkey Vulture soaring below him. Great Blue Heron, Turkey Vulture, Bald Eagle, Merlin, Osprey, Band-tailed Pigeon, Rufous Hummingbird, Belted Kingfisher, Red-breasted Sapsucker, Northern Flicker, Common Raven, Steller's Jay, Violet-green Swallow, Northern Rough-winged Swallow, Barn Swallow, Chestnut-backed Chickadee, Marsh Wren, Winter Wren, Red-breasted Nuthatch, Black-headed Grosbeak, Swainson's Thrush, American Robin, Cedar Waxwing, Red-eyed Vireo, Orange-crowned Warbler, Yellow Warbler, Common Yellowthroat, Pacific-sloped Flycatcher, Willow Flycatcher, Western Tanager, Spotted Towhee, Song Sparrow, White-crowned Sparrow, Red-winged Blackbird, Purple Finch, Dark-eyed Junco and Red Crossbill. Twenty to thirty Common Nighthawks were seen flying over the beach at Qualicum Beach. A Three-toed Woodpecker was observed for fifteen minutes moving through trees at an elevation of 2000 to 2500 feet off the Westwood Lake trail to the summit of Mount Benson. Twelve Least Sandpipers, one Western Sandpiper and two Greater Yellowlegs were seen at French Creek. Ten Mourning Doves were seen along the South Forks Road and Nanaimo Lakes Road in south Nanaimo. Ten Black-bellied Plovers were seen on the Gravel Bar near the Pebble Beach Townhouses in Columbia Beach. Two Caspian terns were spotted at the Beach at Parksville Bay in Parksville. Two Barred Owls were calling and five Black Swifts were seen flying over Colliery Dam Park in Nanaimo. Young Violet-green Swallows were seen leaving their nest box in the 800 block of Harwood Mines Road in Nanaimo. A male Yellow-headed Blackbird was seen at the Nanoose Bay Estuary. A pair of Three-toed Woodpeckers were seen at Mount Washington on the way to Battleship Lake. The Sunday Bird Walk on July 19 will be going to Neck Point Park in Nanaimo. Meet at the Bird store at 9:00 a.m. or at the parking area off Hammond Bay Road at Neck Point Park at about 9:20 a.m. The Sunday Bird Walk went to the Beaver Ponds at Nanoose Bay. The morning was sunny, warm and the winds were calm. Among the highlights of the morning were great views of a Willow Flycatcher perching and singing on three occasions. We watched as a Merlin flew out from a perch several times to catch Dragonflies. We saw two Pacific-slope Flycatcher chicks moving about and calling in the tall trees. We heard a male Black-headed Grosbeak sing and then we spotted him feeding a youngster as they moved through the trees. Near the end of walk we heard a Barred Owl calling "who cooks for you--who cooks for you"
Twenty birders saw and heard the following thirty-five species of birds: Mallard, Hooded Merganser, Wood Duck, Turkey Vulture, Red-tailed Hawk, Merlin, Osprey, Barred Owl, Rufous Hummingbird, Northern Flicker, Pileated Woodpecker, Willow Flycatcher, Pacific-slope Flycatcher, Cassin's Vireo, Common Raven, Tree Swallow, Chestnut-backed Chickadee, Red-breasted Nuthatch, Cedar Waxwing, Swainson's Thrush, American Robin, Orange-crowned Warbler, Wilson's Warbler, Black-throated Gray Warbler, Winter Wren, Bewick's Wren, Bushtit, Spotted Towhee, Song Sparrow, Chipping Sparrow, Dark-eyed Junco, Black-headed Grosbeak, Purple Finch, Red Crossbill, American Goldfinch. The Backyard Wildbird and Nature Store has received several reports of Eurasian Collared-Doves from Ucluelet, Sooke, Nanaimo and Parksville lately. Three Eurasian Collared-Doves, four Common Nighthawks, Violet-green Swallows, Northern Rough-winged Swallows, Barn Swallows, Tree Swallows, ten Purple Martins, a Spotted Sandpiper, a Townsend's Warbler, a Northern Flicker, White-crowned Sparrows and Chipping Sparrows were seen at the Rivers Edge subdivision behind the Weigh Scales in Parksville. Eight Marbled Murrelets and a Pigeon Guillemot were seen on the Strait of Georgia, not far from the mud flats, at the Englishman River Estuary along Marine Drive in Parksville. One Juvenile Glaucous Gull was seen perched on the rocks at French Creek, not far from the Pub. On There was a flock of Glaucous-winged Gulls on the point at the mouth of French Creek and three Killdeer moved nosily over the creek. 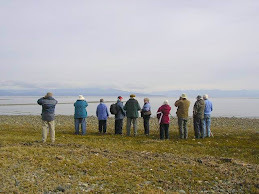 The Tuesday Bird Walk went to the Plummer Road side of the Englishman River Estuary in Parksville. The morning was pleasant and the sun was shining. The highlights of the morning included watching Willow Flycatchers low down in the shrubs along the trail and hearing them and a Pacific-slope Flycatcher singing. We watched as Violet-green Swallows flew low over the mudflats--it was great to look down on them from the trail above. There were several Rufous Hummingbirds and House Finches at the feeders along Shorewood Drive. Purple Finch, House Finch, Pine Siskin and House Sparrow. Twenty-two California Quail were seen in the 2500 block of Maxi Road in south Nanaimo and twenty-four California Quail were seen in the 6200 block of Metral Drive in north Nanaimo. 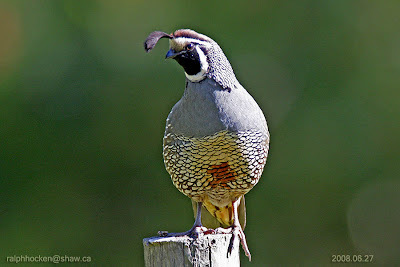 A male and female California Quail and about 12 chicks were seen in the 4100 block of Gulfview Drive in Nanaimo. A Pine Grosbeak was spotted along White Blossom Way in south Nanaimo. Everyone is welcome to join us for a 2-3 hour bird walk on the Sunday. We leave from the Store at 9 A.M. Sunday Mornings and go to a different location in and around Nanaimo. The Sunday Bird Walk on July 12 will be going to the Legacy Marsh in upper Lantzville. Meet at the Bird store at 9:00 a.m. or at the parking area under the Hydro lines along Normarel Drive at about 9:20 a.m.